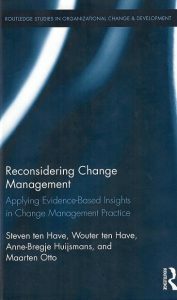 In the book Reconsidering Change Management the brothers Ten Have, together with several colleagues, decided to investigate the scientific foundation of 18 popular change management theories. As the topic of change management has received considerable attention these past decades and as many theories are doing the rounds this effort is very welcome. In the book the authors describe these 18 theories in great detail and also how they investigated the academic foundation of these theories. They used the ‘rapid evidence assessment’ technique which comes down to a systematic review of the literature available on a specific theory, assessing this literature on its validity (i.e. how rigorous were the research methods used), and then ranking the theory by the strength of the available academic evidence. In the table below I have collected the findings of their investigation. There are three categories: the theory is substantiated, i.e. there was enough strong academic evidence for the theory; the theory is unsubstantiated, i.e. there was not or hardly any evidence which in addition might have been of questionable quality; and the findings about the theory are inconclusive, i.e. there is some evidence but often the ‘proof’ depended on the context in which the effects of the theory were measured. The results listed in the Table are rather sobering. The authors found academic proof for only five of the 18 investigated change management techniques, while seven techniques were actually unsubstantiated by scientific research. Mind you, these techniques are still peddled by consultants and organizations actually pay good money for these, basically for something that does not work. From the remaining six techniques the evidence is as of yet inconclusive and need more evaluation in the future. If this book shows one thing it is that a critical review of the organizational improvement techniques proposed and marketed in the professional literature is sorely needed. After all, it is a fair assumption that more professional fields than only change management will suffer from the same ills. In retrospect one can say: what a marvelous idea, why didn’t anybody think of this before? Well, these authors did and that makes their research and book an example for all us academics. The method used by the authors is a great way to review more improvement techniques, such as the abundance of frameworks and models to create high performance organizations (including my own framework). In this way, the academic community can offer managers information about what works and what doesn’t which will be very welcome to them and increases the value of academia for managerial practice. At the same time it will develop a healthy skeptical attitude in managers so they will not fall for the next consultant with a nice power point presentation. “Bring me first the proof!”, will be from now on a widely used exclamation in boardrooms!